There is no doubt that paying for the publication of open access through article processing charges has been increasing steadily over the past decade and in some disciplines is becoming a mainstream scholarly publishing activity. The numbers are not trivial, one of the largest fully open access publishers, PLOS, recently published their 100,000th article. In 2013, Australian researchers published over 1500 articles with another fully open access publisher BioMed Central. A cursory consideration of the management of article processing charges shows all players in the publication system are affected, including the researchers, funding bodies, publishers, libraries and other institutional administration (such as research offices). Many of the relationships between players in scholarly publication need to be reconfigured, or in some cases developed, in this new environment. Libraries have traditionally had a relationship with publishers through subscriptions, and in some instances it might seem obvious that libraries should therefore take responsibility for the payment of article processing charges. But often the ‘bucket of money’ in an institution that pays for institutional subscription is not the same one that supports open access publishing. If the payment of article processing charges is coming from funding grants then this money will usually be managed by the research office. There are two questions in this area – where does the money come from, and how should it be managed? As government, funding body and institutional open access policies increase, funds for the payment of article processing charges are becoming more prevalent, particularly in the UK and Europe, as noted on the ‘Funding hybrid’ page. The 2013 Report of the Working Group on Expanding Access to Published Research Findings (known as the Finch Report) recommended that “a clear policy direction should be set towards support for publication in open access or hybrid journals, funded by article processing charges, as the main vehicle for the publication of research, especially when it is publicly funded”. As a result, block grants from the Research Councils in the UK have been established to pay for this activity. The 28 January 2014 speech by Dutch State Secretary, Minister of Education, Culture and Science, Sander Dekker reflects this position. He stated: “I am going for the Golden Road”. The Netherlands Organisation for Scientific Research (NWO) has an ‘Incentive Fund Open Access’. Elsewhere, there is the ‘Open Access Publishing‘ programme from the German Research Foundation (DFG). Some funding bodies also commit to paying for open access charges, such as the Wellcome Trust. In Australia, while neither the ARC or the NHMRC open access policies refer to payments for article processing charges, both organisations do allow some of their grant allocation to be directed to publication costs. Overall the percentage of institutions with a central fund to pay publishing charges is small. Surveys in the UK in found that in 2009 14% of responding institutions had central funds (8 out of 55) and that had risen to 15% (7 out of 52) in 2011. In Australia and NZ a survey undertaken in 2012 (in press) found that at the time there were only two universities in Australia with a central fund, and there are none in NZ. The only Australian fund listed on the Open Access Directory list of OA journal funds is QUT‘s. Anecdotally it appears this is a constantly changing situation. Several Australian universities have memberships with open access publishers, or publishers offering hybrid open access, therefore to some extent centrally support open access publication. An example is the University of Queensland, In these instances the library is providing the funds. The 2009 report from the Research Information Network and Universities UK “Paying for open access publication charges: Guidance for higher education and research institutions, publishers and authors” provides advice on how to set up a fund. Stephen Pinfield argues in his 2010 paper “Paying for open access? Institutional funding streams and OA publication charges” that there is a need to manage these funds centrally, providing some advice about how to go about doing so. In 2011 the ‘Open access business models for research funders and universities’ looked at many business models for open access, including a study looking at two institutions which have a fund for the payment of open access charges. Institutions that do offer a central fund usually have some criteria for what is supported or not from within the fund. As an example see here for an analysis of various funds’ support of hybrid open access. Often these rules will exclude publications that have another form of funding available to them, and be specific about the affiliation and career status of the lead (or) all author(s). In some cases specific publishers or journals are identified as being within scope. It is worth noting that with the exception of the final criteria, many of these rules are also imposed by Australian libraries on which publications are eligible to take advantage of discounts offered through memberships with some publishers. One example is the eligibility criteria listed by the Australian Catholic University. The recently published report “Developing an Effective Market for Open Access Article Processing Charges” lists proposed minimum quality standards for eligibility for funding, either institutional or grant body (see section 4.2). As an aside, even when there are funds available, often authors do not know that they can apply for such funds, as it has been shown in a 2012 HSS researcher survey from OAPEN UK (see slide 27). Moving away from the question of where the money originates, we can now address the issue of how to manage the payment of APCs. There are two primary models – to have centralised management or to leave the payment in the hands of the researchers. There is no question that management of article processing charges (APC) can be highly complex. 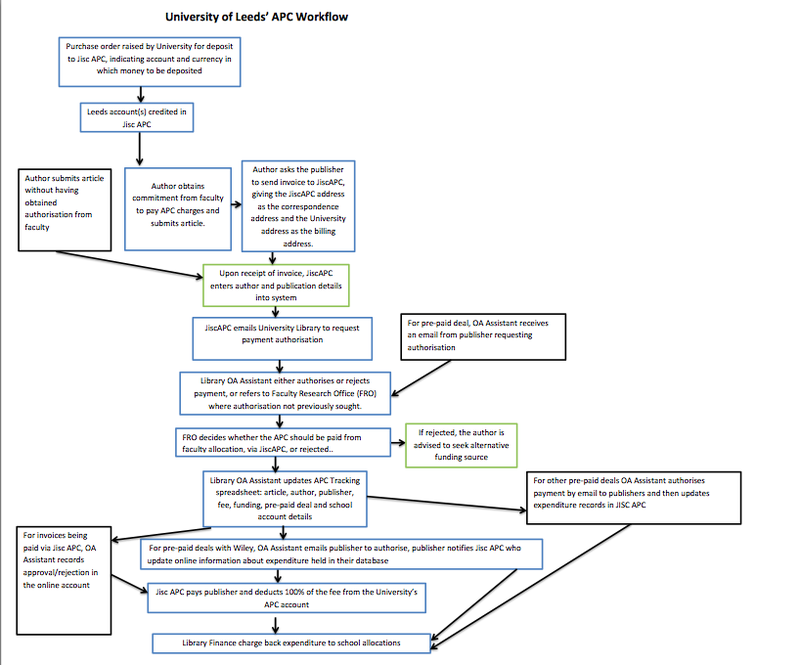 A short glance at the University of Leeds’ APC workflow, in their Case Study demonstrates this admirably. The University College London is another institution administering its own article processing charges. Examples of institutions creating policies to administer the RCUK block grant for funding, include the University of London and Oxford University. Indeed, a roundtable of librarians held by Sage and Jisc in the UK in October 2013 found that managing article processing payments is a ‘huge headache’ for librarians – or at least promises to be when volumes increase. A report from that roundtable noted that some single transactions have taken three to four hours of librarian time to complete. These concerns have sparked the argument for intermediaries in managing the payment of article processing charges. Not surprisingly, several intermediary services have already started up, many responding to the increased uptake of paid open access options as a result of the RCUK open access policy that came into force in the UK on 1 April 2013. The Jisc APC management service pilot is running two ‘strands’ – one exploring key issues and challenges in a gold open access environment while the other offering an ‘online administration platform’ for the payment of article processing charges. The service includes: “holding funds for institutions, making timely payments to publishers and providing the financial reports designed to help manage funds effectively, as well as publisher engagement through a range of options for participation”. This service addresses the issue of reporting requirements on the part of funding bodies in the UK. Libraries are typically not responsible for the reporting of institutional outputs, and publishers are not necessarily collecting information about supporting funds in a way that can generate these reports. There is some argument that centralising payments removes the transparency authors have with the costs of publishing under an article processing charges system. Under the subscription model, from a researcher perspective it is ‘free to publish’ and ‘free to read’. It is often surprising to realise how few researchers are aware of the huge subscriptions paid by their institutions for access. Given that the majority of researchers never darken the door of a physical library because they can access all work seamlessly online it is understandable that many have stated “research is already open access” when asked. However the increase in the payment of article processing charges has awoken many researchers’ awareness of the costs of publication. An author’s reaction of surprise to the request for a $3000 article processing charge when they are contacted by a publisher provides an opportunity to discuss the costs associated with publication. Some people have argued that as payment for publication at an article level becomes more prevalent, it gives the researcher an opportunity to determine value for money and in some arguments this means that scholarly publishing would be a more functional market. This is then one of the disadvantages of having centralised management of article processing charges – it once again quarantines the researcher from the cost of publication, returning the status quo between libraries/institutions and publishers. On the other hand, if the process of paying article processing charges is too complex, it is quite possible researchers will become frustrated with the process and simply give up on open access, supporting the argument for centralising the payments. There are some benefits from centrally managing article processing charges, for example the ease of accounting. When payments are left to the individual or department – rather than managed by the library or a broker – it becomes difficult to determine the amounts being paid out by the institution as a whole. propose good practices and proven workflows.